Our panel of non-experts weigh in on this week's news events in a parlor game to gauge what kind of week America had. Joining us on this week's panel are Jay Smooth, a video blogger for the hip hop blog "ill doctrine" and Sara Smith, associate editor of Wonkette.com. This week, representatives from the big three auto makers were rebuffed in their effort to secure $25 billion in federal bailout funds. No vote was held, but Congress asked them to come up with a plan by December 2nd on how they'd use the money to avoid bankruptcy, layoffs and plant closures. Failure of auto maker bailout: good news bad news, or no news? After vigorously campaigning for John McCain for the last several months, Connecticut Senator Joe Lieberman was in trouble with fellow Democrats. Some wanted to strip his chairmanship of the Homeland Security committee. 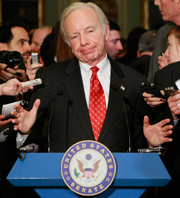 Ultimately, after much debate and President-Elect Barack Obama indicating he supported Lieberman, Joe stayed put. Lost a spot on a global warming subcommittee, that was it. Was Lieberman's fate good news, bad news or no news? Sites like Facebook and MySpace are helpful to teenagers because they help build social skills and Internet literacy as well as teach managing a public identity--this according to a new study by the MacArthur Foundation and not, apparently, funded by either Facebook or MySpace. Or Tiffany from homeroom. Is this finding good news, bad news or no news? Would you want new woolly mammoths walking around? It was reported this week that for as little as $10 million, scientists could map the genome, then grow new mammoths! Which could then reproduce and repopulate. Would new mammoths be good news, bad news or no news? We help to avoid encountering financial shortage so we had rather recommend funding options for the auto industry. Among the funding options we have are payday loans, or a cash advance that you pay back quickly, usually the next payday. It isn't exactly a surprise – the auto industry is teetering on the brink, and financial industry giants are also on the edge of contemptible doom, leaving the consumer with fewer options. Layoffs plague the world landscape; the Yahoo layoffs, from such a large and reputable company just hammers the point home of the need for debt relief, but with fewer funding options. Linda Meehan: A couple of things -- the three executives EACH took a private jet, so it wasn't three guys in a jet, which would have been smarter, not to mention Less wasteful. And the military transport that Pelosi takes is making the trip anyway and she just hitches a ride. I was interested in the discussion about social networking sights such as Myspace and Facebook. I am an English teacher, and I'm also an avid Facebook user. Like any other media, there are those who use it for their own education and benefit, and there are those that use it to further their interest in inanity. The great thing about these sights (and Facebook does have pretty decent layouts that cannot be changed) is that they allow information to be shared: people blog, post links to news stories, invite their friends to support social causes, and of course look at pictures of friends' parties. Young people are not illiterate because they use sites like these; they're illiterate because they're not reading blogs that make arguments in standard written English. There are, however, a lot of people--young and older--who are in many ways socially illiterate because they're not using these sites. As we've seen recently through the grassroots campaigns of politicians and gay rights activists, social networking sights are an effective tool for any cause. Sarah Smith's comment about the heads of the big 3 auto makers taking a private jet to beg Congress for money being stupid is indicative of what I believe is a complete breakdown of understanding about what it is to be a Liberal and what it is to be a Conservative. I'll agree that it was a stupid PR move on their part, but let's acknowledge that their companies bought and paid for (earned) the right to fly that private jet. Conservatives believe in earning and paying their way, so their begging Congress for a bailout is a great embarrassment to all Conservatives and let's hope that Congress sends them packing. But let's recall that Speaker Nancy Pelosi takes a taxpayer-funded ride on a military jet back to her home in California every week. Now I'm not blaming the Speaker, except that if she practiced what she preaches she would be riding in coach like most of the rest of us. No, the Pentagon has decided that the TSA can't be trusted with the Speaker's security. (My security, on the other hand, and yours, is entrusted to the TSA routinely and we are told not to worry.) The difference between the big 3 riding in a private jet and Speaker Pelosi thumbing on a 50-seater military jet is stark, but Sarah misses that point entirely. Is it more honorable to let the government take care of our every need from cradle to grave? Frankly, I still feel pride in things like ownership and accomplishment and I fear that the coming generations won't ever know the same. And that is the difference between Liberals and Conservatives. Get over your hatred for Bush, Sarah, and let's exchange ideas.